Opera Shade System offers a truly unique and perfect room darkening shade, its innovative design combines the beauty of a wide assortment of elegant fabrics multitude of product categories and the functionality of a room darkening fabric. 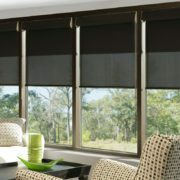 The dual shade provides the ultimate in light control and protects your interior furnishing from the suns damaging UV rays. By controlling each shade independently it give you the maximum flexibility while optimizing your design options. The sleek fabric wrapped cassette requires minimal mounting depth and it provide a continual flow in your window.